Surprise your house tiger with the KONG Cat - Purrsonality Moody! You can fill this cat toy with the pot of catnip that comes with it. The herb will make this toy irresistible for your house tiger! Want to surprise your cat with a new toy? The Purrsonality Moody from KONG will undoubtedly become your cat's new favourite toy! 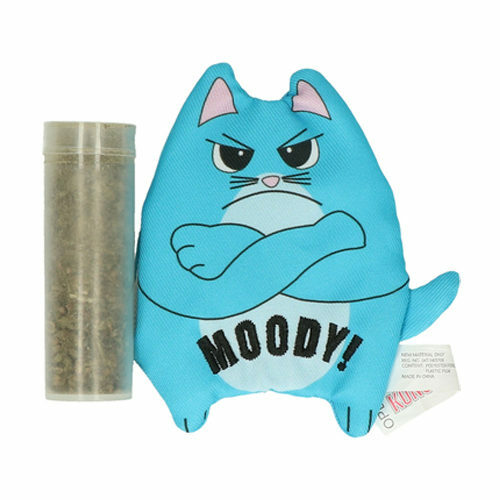 This toy in the form of a moody cat can be filled with catnip. Lots of fun guaranteed! The toy comes with a pot of catnip, so you can refill the toy when its effect diminishes. Can be filled with catnip for irresistible fun! Have you used KONG Cat - Purrsonality Moody before? Let us know what you think about this product.